The heart of Christian discipleship is twofold: To live and grow in a deep relationship with God in Jesus through the Spirit, and to allow the Spirit to work through us to bring about the reign of God on earth. From the moment of his conversion, even while still recovering at Pamplona, Iñigo began to share his spiritual insights and reflections with those around him. This practice of spiritual conversation permeates his writings and work. It became the normal means by which he shared his growing understanding of the ways of God. Most significantly, such dialogue turned a group of students in Paris into ‘friends in the Lord’, companions in the deepest sense of the word. 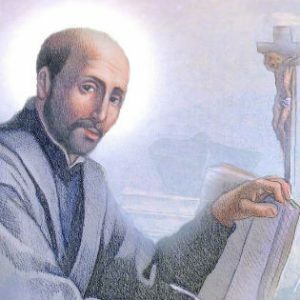 As mentioned earlier, the first two of Ignatius’ companions were his room-mates at the University of Paris: Fellow-Spaniard Francis Xavier (1506-1552) and Frenchman Pierre Favre (1506-1546). Within a short time, this number had expanded to include three Spaniards, Lainez, Salmeron and Bobadillo, and the Portugese Simon Rodrigues. Each member of the group had resolved to abandon his worldly ways and dedicate the rest of his life to serving God single-mindedly. In order to discern what this might mean in their life as individuals and as a group, Ignatius led each of them privately through the Spiritual Exercises during the course of 1534. The magnanimity which came to characterise the Society is exemplified in the phrase which became their motto: Ad majorem Dei gloriam, To the greater glory of God. On August 15, 1534, this little group of seven took religious vows in the small chapel of St Denis, close to the great basilica of Sacre Coeur at Montmartre. As part of this dedication, they vowed to offer themselves to the Pope to be totally at his service, ready to go to whatever mission and whatever part of the world the Vicar of Christ should see fit to send them. This promise of obedience directly to the Pope remains a distinctive feature of the Jesuit order. As the founding group of the Society of Jesus, these companions of Jesus and of one another planned to go to Rome to offer themselves to the Pope in fulfilment of their vow. However another war broke out so that it wasn’t until 1537 that the little group, now nine (with Codure, Le Jay and Broet), arrived in Venice and began to preach and minister to the sick in hospitals. It was here in Venice that Ignatius and those of his companions who were not already priests, were ordained on June 24, 1537. Finally, they travelled to Rome in smaller groups, Ignatius with Favre and Lainez, arriving there in 1538. The group of friends whose first steps towards becoming a religious order began with their taking vows at Montmartre in 1534, now received official approval as the Society of Jesus. Ignatius was elected their Superior General, and in 1541 began to draft the Constitutions of the Society, completing them in their definitive form in 1550. 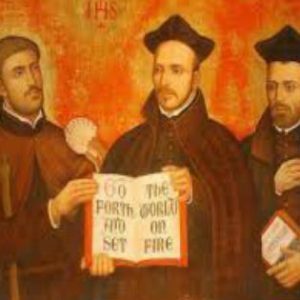 From 1540 to his death on 31 July in 1556, Ignatius governed the Society from Rome. Meanwhile, the other companions carried out their work of giving the Spiritual Exercises, education and caring for the poor and sick, at first in Rome, then ultimately throughout Europe and the Far East.